Last weekend, I stopped by Native Roots Market for some groceries, hoping to find some inspiration while I was there. Some beautiful, local collard greens from my friends at Peach Crest Farm caught my eye. It seems strange that after living in the borderline-Southern state of Oklahoma my whole life, I’d never tried collard greens. I’ve been trying to branch out and try different kinds of produce, so into the basket went the collard greens. At home, I tore off a little piece and nibbled on it, raw. Nothing special, tasted sort of like kale. Later, I recalled some collard wraps I’ve seen in blogland and tried using blanched collard leaves as wraps for the last of my lentil curry. The taste wasn’t worth the effort. Then I recalled my friend Matt telling me how great collard greens are when they’re sliced super thin, so I got to googling. I googled my way past all the slow-cooked, bacon-heavy Paula Deen recipes and found a tutorial for Brazilian collard greens. The idea is to slice the greens as thin as possible, and sauté them for just a few minutes, until they’re dark green and fragrant. The technical term for this slicing technique is chiffonade. I tried cooking up one big leaf in this manner for “dessert” and hello, lover! I’m smitten with collard greens. 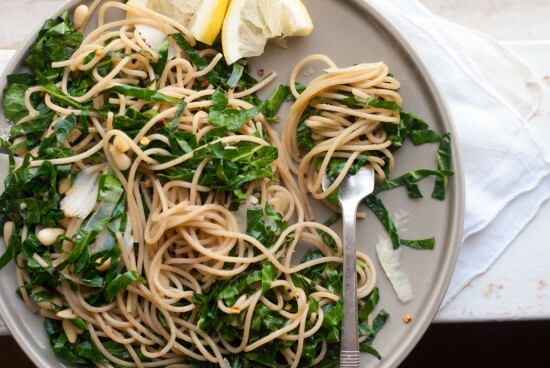 This lively spaghetti dish came to me as I twirled my fork in those spicy, skinny greens and fortunately, it is just as good in reality as it was in my head. I don’t know whether to call this recipe Southern due to the collard greens, or Brazilian because of the method, or Italian since it’s a pasta dish. Southern-Brazilian-Italian fusion, anyone? Never mind. Whatever you want to call this dish, it’s spicy and bright, with bold lemon flavor, and comes together in a flash! The one-to-one ratio of whole wheat spaghettini to produce is just the way I like my pasta. 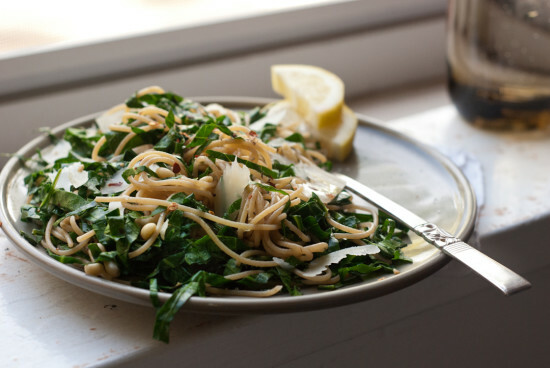 I hope you’ll give collard greens another chance with this lemony pasta recipe. Super quick, bold and bright pasta dish tossed with thinly sliced and sautéed collard greens, lemon juice, pine nuts and spices. Bring a big pot of salted water to a boil and cook the pasta according to directions. Drain quickly, reserving a bit of cooking water, and set aside. Cut out the center rib of each collard green. 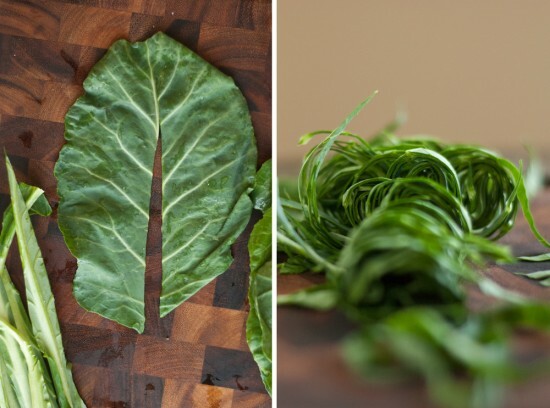 Stack a few greens at a time and roll them up into a cigar-like shape. Slice across the roll as thinly as possible (⅛″ to ¼″). Shake up the greens and give them a few chops so the strands aren’t so long. Heat a heavy-bottomed 12″ skillet over medium heat and toast the pine nuts until they start to turn golden and fragrant. Pour them out of the skillet and save for later. Return the skillet to medium heat and pour in a tablespoon of olive oil. Sprinkle in a big pinch of red pepper flakes and the garlic and stir. Once the oil is hot enough to shimmer, toss in all of your collard greens. Sprinkle the greens with salt. Stirring often (try not to let them clump), sauté the greens for about three minutes. Remove the pan from heat. Scoop the greens into the pasta pot and toss with another drizzle of olive oil, adding pasta water if necessary. Divide onto plates, top with pine nuts and Parmesan shavings and serve with two big lemon wedges per person. Although I haven’t tried it, I think walnuts would make a fine substitute for the pine nuts. Vegans, you can totally skip the cheese. It’s still great without it. Use a cheese plane to create Parmesan shavings. I’m over grated Parmesan; shavings are the way to go! Peach Crest collard greens, Bionaturae spaghettini, Canaan olive oil and pine nuts kindly provided by Native Roots Market. This looks so yummy! 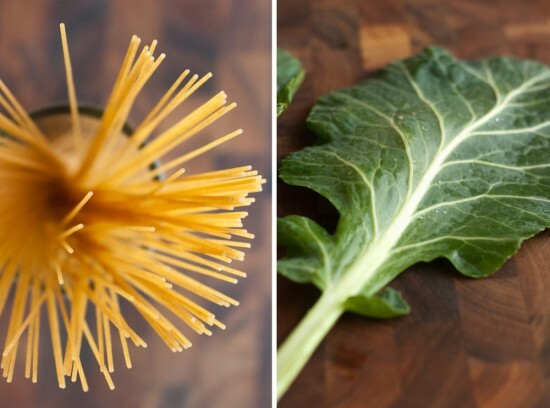 I would have never thought to add collard greens to pasta. I often make pasta with sautéed greens, red pepper flakes, and parmesan, but never with collard greens. It’s nice to shake up the routine a bit, and I look forward to trying this recipe with collard greens. In Arkansas, where I grew up, we ate cooked collard greens and mustard greens with hot pepper vinegar. Do you guys have that in Oklahoma? I love fresh, healthy dishes like this one… the greens and the lemon just make it so light and bright! 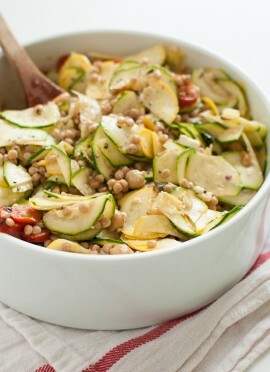 I love how healthy and wholesome this recipe is! :) The best part about it is the thinly sliced collards. You know, I have always chopped my leaves roughly and they’re always in big chunks. Thinly slicing them makes them look pretty and probably brings out flavor too. Simple, classy, delicious! 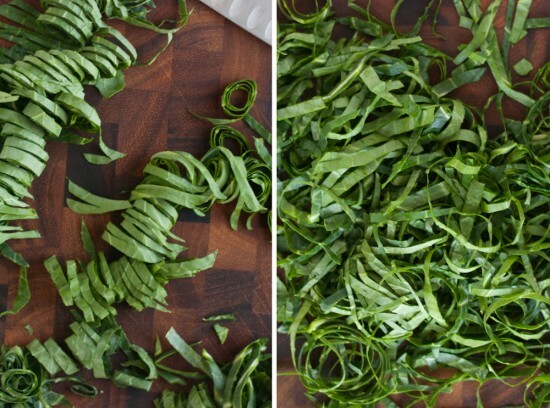 I became obsessed with collard greens over the past year and slice them exactly like that. I was always under the misconception that they had to be coked for hours on end like they are in the south until they are mushy and quite an unpleasant green color. Thank goodness I figure out that’s not the case. If you ever do them as a side dish by themselves try a dash of apple cider vinegar while you saute them, it’s delicious. I just tried collard greens with apple cider vinegar for dinner. Yum! Thanks for the suggestion! I’ve never had collard green’s before. This sounds really refreshing. I think I might give it a try this weekend. The thin strips are such a great idea – they look so pretty! Besides sauteing them, I’ve been adding collards raw to smoothies and using them in place of wraps (sorry, but I like them this way!). My next venture is going to be testing out collard green pesto. Here’s a little helpful bit of info for you – I read that collards keep the longest in your refrigerator when compared to all other greens out there! Those are all wonderful ideas! I’m eager to find out how that collard green pesto turns out. Kate – I had lacinato kale to use up so I just did a vegan kale pesto. Check it out! I can’t wait to sub kale for collards later this week! one of the first things i ever learned to cook was nigella’s lemon pasta. i love this greened up spin! I want to live inside your mouth. i do not want to live inside your mouth but, will continue to read the comments. Hey Kate! Just made yo banana bread recipe yesterday. It was FANTASTIC!!!! Beautiful! I never know what to do with collard greens… great idea! Great way of using collard greens! It’s totally new for me :) And I would love to try it! I’m from The Netherlands and we eat a lot of collard greens during the winter, we boil them together with potatoes and mash them up with butter, milk, nutmeg and mustard. But this is far better for spring! I had no idea that collard greens are popular in The Netherlands! Your mashed potatoes sound great. I hope you’ll give my technique a spin! Sounds a lot like the Irish dish colcannon, which to simplify is mashed potatoes and greens (usu kale or cabbage). This looks absolutely beautiful…love those dark green tangles mixed in with the pasta. I love all sorts of greens, this looks super! I love pasta with greens and lemon, I’ve never tried collard greens though, living in Australia I’m not sure what they are but am v. intrigued. Your collard ribbons are beautiful! This looks totally simple and delicious. Spring is one of my favorite times to eat collards because I get the small tender ones in the market and they’re great raw. This look so fresh, light and pretty! Bookmarked for a weeknight dinner! yum! Your collard green ribbons are so pretty, and of course I love anything with lemon! I’ve never cooked with collard greens before. Going to have to give it a try because this pasta looks delicious! Ohhh collard greens! I love being able to discover different kinds of greens just by chatting with the farmers that bring their goodies to the farmer’s market every week. I usually just pan sear mine, but can imagine how delicious they are in pasta. Today, I spotted some stinging nettles at the market, but I think I’m still not ready for them! Honestly, I don’t know a thing about stinging nettles. They sound scary! Googling now. Collard greens are one of my favorite leafy greens! They are versatile and so hardy. Did you save the stems? They are also fantastic sliced very thin and thrown into a stir fry! This is such a simple but lovely meal. I can’t wait to try it. I wish I had collard greens in the house now! Yum! Looks delicious and healthy! I love good excuses to eat pasta! can you fly out and make this for me when i get home tonight? k thanks. I love the ratio of greens to noodles in your photo. This is such a healthy way to enjoy pasta. Up there in your comments, Abby mentioned wanting to make pesto with collards. I do this all of the time with kale, and I’m sure it would work beautifully with collards. (With the kale, I often use walnuts, hazelnuts or almonds instead of pine nuts.) If you don’t put cheese in the pesto, it freezes well, too. Thanks for your great comment, Cathy! I’ve never met a pesto I didn’t like. I like freezing mine for later, but I usually make too much at once and it takes me forever to eat it all! Once I finish my basil pesto from last fall I’d like to try this kale, roasted red pepper and pecan pesto recipe I found. I’ll definitely post it if it’s as good as I think it will be! I also like this balance of greens to pasta, and think sturdy greens with whole wheat pasta is one of the best pasta combos going. I am looking forward to trying this lemony approach. 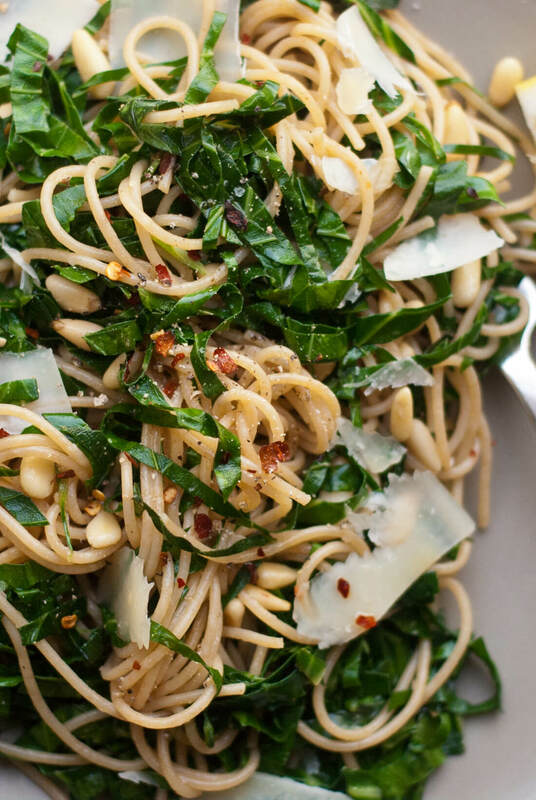 My current favorite is garlicky, spicy dandelion greens with whole wheat spaghetti and blue cheese. That sounds fantastic! I have never tried dandelion greens but I will keep an eye out for some. I love spicy greens so I’m sure I’ll enjoy them! I tried this recipe last night and it was delicious. I got collard greens in my CSA box and had no idea what to do with them. This pasta was great. We used walnuts, since that’s what I had. Added good crunch. The lemon really made the dish, though. We tried it first without, and then with the lemon squeezed over the top and my husband agreed that it really made a huge difference in flavor. So glad to hear that you enjoyed the collard greens, Jennifer! I don’t like soggy greens so I much prefer them prepared the Brazilian way. I’ve been squeezing lemon onto all sorts of dishes lately; it really brightens the flavor without adding any fat or sodium. You’re right, it really makes this dish! This was so yummy! I used walnuts instead of pine nuts and only had brown rice noodles on hand, so used those and it was really great. Thanks! I’m about to make these and I realized that I’m not sure when to add the garlic from the instructions above. I’m going to assume that its with the red pepper flakes in the olive oil, but if I’m wrong, could you let me know? I’m sorry for the confusion, Laura! Yes, you are correct in adding the garlic along with the red pepper flakes. I will correct the recipe. i liked this so much i made it two nights in a row! first w/ collard greens and walnuts, second with rainbow chard and sesame seeds!! thanks! Made this last night and did a bit of a redux to make it “no added oil, no added salt.” Used whole wheat linguini and cut the collards to the same width to match. Used no oil and used low-sodium veggie broth instead to saute the garlic and red pepper flakes. Added the collards and added a little extra veggie broth, but used no salt. Fantastic! Thanks for the fab recipe! I’m always looking for things that can be low-fat, low-sodium, and still taste delicious! Thanks so much for commenting, Laura! It’s great to hear that this dish can be made to suit low-fat, low-sodium diets. Glad you enjoyed it that way! Just wanted to tell you that I’m making this for the second time (although over quinoa the second time) and I LOVE this. Thanks so much! Loved this recipe! I was browsing online looking for a new way to use collard greens for dinner, and this was way better than what I expected to find–a delicious recipe and a great blog. I was so excited to have the leftovers for lunch today because the recipe was so tasty. Thanks for sharing! So glad to hear you enjoy the collard greens pasta, Caitlin! I’ve yet to find another technique for cooking collards that I enjoy as much as this one. Just made this for dinner and it was delicious! So quick and easy – perfect for a weeknight dinner. I hope to make some again soon! That’s great to hear! Thank you, Gina. I’m a sauce girl myself, but something about the collard greens and lemon is just right. This was so delicious!!! Thank you for this great recipe. I get a bunch of collard greens every week from my CSA basket and have always had a love-hate relationship with them. I love the nutritional value but their bitter taste was hard to swallow at times (literally). :) It has been a challenge to find ways to make it appetizing and they are sadly the last thing to get used or not at all. With this recipe I used almost all of it and it was delicious! Thanks again for bringing some excitement to collard greens! Thanks, Linda! So glad you enjoyed the collard greens cooked this way. Those little collard ribbons make a fun garnish for soups and such as well. Thank you, Crystal! Glad you enjoyed it. 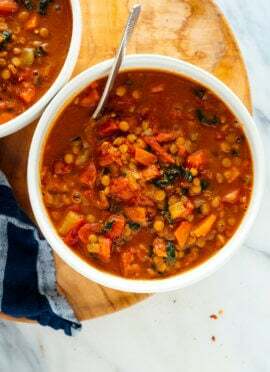 Made a big batch of this tonight for a bunch of fussy eaters, and it was a HUGE success! 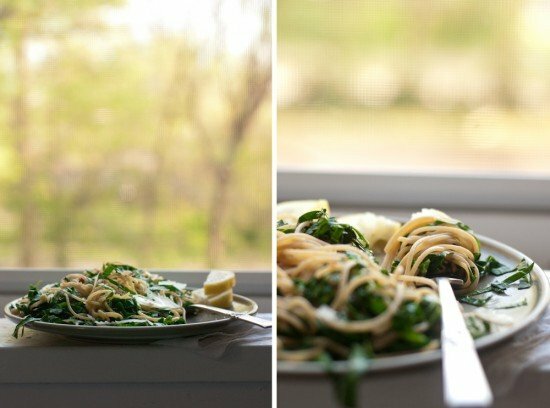 I used kamut pasta for the gluten intolerant among us, and it worked out beautifully. I scaled the recipe up for 6 people, so I did the collards in a cast-iron wok, which was just the right size and made it easy to stir quickly and keep the greens from clumping. Everyone went back for seconds, and we practically licked the bowl clean. Thank you! So glad to hear it, Missy! I’ll have to hunt down some kamut pasta to try. Great idea to cook the collards in a wok, too. Thanks for commenting! I’m so glad you’re loving this recipe. It’s so simple and tasty. Hope you enjoy the other recipes! I have made this recipe several times, it’s delicious! I always use crushed walnuts instead of pine nuts. This time in going to add a little bit of Kalamata olives to it. I think it will be a great addition to the dish! Thanks, Samantha! Glad you’re enjoying it! I bet olive will be lovely. It’s not that I don’t trust you. I just love garlic and spice. I always (at least) use double the suggested garlic and hots in a recipe. This one came out really well that way too. I love it when my food is so spicy it hurts so good. I also topped my dish with a requisite fried runny egg. (: thank you for another winning recipe! Thanks, Slavomira! I looove spicy food, too, but I try to keep spice levels under control for the masses. :) Glad you enjoyed this one! Fried egg sounds like a great topper. I was looking for a recipe for collard greens on yummly’s app and your recipe popped up. I ended up adding some basil, cut the same way, and lemon juice. I also added shrimp in the last 3 minutes of cooking. It turned out really well, except that I forgot to stir the collards enough so clumping did happen- oh well. I volunteer at a kid’s community center garden and we always have tons of collards. The kids eat them raw and will eat them in salads, but I can’t give them away to the adults- everyone says they just take too long to cook. Not anymore, thanks. I think I’m going to make this recipe to demo how easy it is to cook collards. Yay! Hope everyone enjoys the collard ribbon technique. Thanks, Jess! This was incredibly easy and WOW it was SO delicious! I used the pine nuts because I had them…but I agree, walnuts would probably be terrific too–next time! Omigosh, this was so delicious, even without Parmesan (to make it vegan)! Loved this recipe! Never had collard greens before, and living in the south, the bacon recipe did not interest me. Made this for my family, and even my 16 year old son loved it. Am definitely recommending and will make again!! Thank you so much! 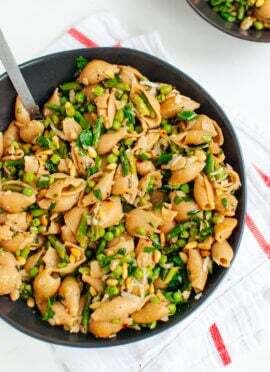 This recipe has turned out well for me many times and with many variations: I love it as is, I’ve made it with lacinato kale instead of collards, with oat groats instead of pasta, almonds instead of pine nuts. It’s simple, quick, delicious, and, best of all, satisfying without being too heavy. I make it for a couple weeks, forget about it for a few months, and then remember and fall in love with it all over again. And that’s what’s happening now. Bravo! Hi, going to try this recipe! I’m dairy free and wondering if I could sub nutritional yeast for the cheese? Substituted sunflower seeds for pine nuts, and it was awesome! This recipe is simple, excellent, and filling. I made this with bok choy and walnuts because that is what we had. It was great. I will try it again with collard greens. Substituted walnuts because I had them on hand. Added 1/4 c white wine to the collard greens, and added a bit more Parmesan into the pasta mix before serving. I wish there was more, I’d have seconds for sure! This recipe will be repeated often. Thank you, Cara! That’s great to hear. Made this with Kale. Delicious, fast and easy!! Can not wait to try this recipe! I recently blogged about how eating junk food makes us crave junk food. However it also works the other way around. When we eat healthy our body starts to enjoy and crave the nutrition it receives. Thank you for providing healthy recipes that are not only good for you but taste good to! That’s great, Sarah! I’m so glad they included this recipe– it’s an oldie but a goodie! I served this along with chicken breast. My daughter thought it was a very fancy dinner. This is now my favorite recipe for collards! This was INCREDIBLE. I’m already planning to cook it again tomorrow – the flavours work so well. That’s awesome! I’m happy you liked it so much. Thanks for the review. I found out that I am not able to eat meat, and this has completely turned my world upside-down. I am still in high school and living into at home and my family is a big meat-eater family, so most nights I only eat noodles, rice, or any other type of side. These recipes look like they will help me a lot. Thank you for all your hard work and for truly following your passion, it’s really an inspiration. It can be a transition, but this for sure will be a great resource for you! Good luck, Kassidy. When I read this recipe, I thought it looked healthy (eye roll) but decided to try it. Oh. Ma. Ga. It is one of my absolute favorites! I had no idea I loved collard greens (my bf calls them “greens of collard”). Often I don’t even bother with the pasta. Love it! Prepared the right way, they are delicious! Thanks for your review, Jan. I have a beautiful bunch of very large collards in my fridge so was considering making collard wraps tonight until I found your recipe. I am Paleo/grain-free so will make with shiritaki noodles or zoodles in place of the pasta. Will serve as a side to crab-stuffed salmon w lemon butter, can hardly wait for dinner tonight!!! Thank you for sharing your hard work. Oh wow!!! I had beautiful Swiss chart and no idea what to do with it. Luckily I have you on “speed dial “. This was so delicious and fast!! and very pretty. The chart gave the pasta a soft hew of orange. Wish I could add a picture. Thank you so much Kate. You’re welcome, Laura! Thanks for your review. Some brands are actually vegetarian. You just need to look at the ingredient list. Thanks for your review, Lucy! I tried this recipe and absolutely loved it! Quick and easy. This will be one of my go-to recipes when I want pasta. Made this tonight…loved it! Added pancetta with the garlic…what a flavor explosion! Someone gave me collards from their garden and needed a recipe…Amazing and now a new go to recipe! Thanks for sharing your variation, Wendy! Mad this last night, it was so simple and delicious! No leftovers with this dish, haha. Thank you! I’m so happy you loved it, Jess! Thanks for your review.